Select fresh Pomfrets & get it cleaned from the fishmonger. Wash the fish well & drain completely. Apply turmeric, a little salt & lime juice to the entire fish & keep aside for about 10 mins. Drain out excess liquid. Fill the pockets of each pomfret with the Goan Recheado Masala paste (Refer to the post on Goan Stir Fry Prawns) making sure the masala paste does not spill out. 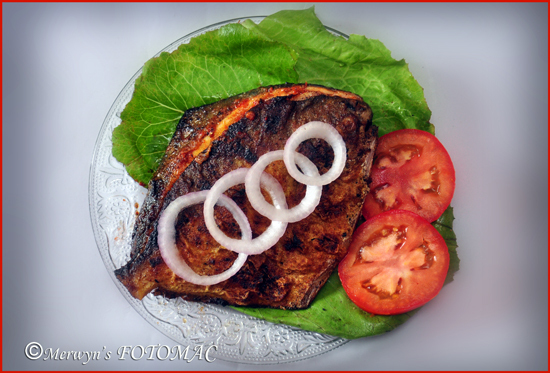 Place the wheat flour on a plate & roll each stuffed whole pomfret in the dry flour. Reduce heat & gently slide in the pomfret. Fry on med. heat on each side for about 3 mins. Serve as a starter or enjoy with your favorite fish curry & rice or steamed rice & dal fry/tadka. Fresh fish & fresh spices enhances & brings out the flavors better. You may grill/ bake the fish if you wish.